Earlier this month, Jeff Selingo wrote in The Washington Post about the coming era of consolidation among colleges and universities. Mr. Selingo based many of his comments on findings from a study by Parthenon-EY Education to which he also contributed. high debt payments for recent campus capital improvements. As expected, nearly 80 percent of these potentially unsustainable colleges are small – with fewer than 1,000 students – but nine percent have more than 10,000 students. Some may consider these bleak conclusions. But they do not mean that the sky is falling for American higher education. Mr. Selingo notes that higher education is primarily a location-bound, highly regulated, bricks-and-mortar industry with wide variations in capacity to reflect changing American demographics. He notes that the report suggests that circumstances will force many institutions into deeper partnerships with one another. There is a good deal of common sense embedded into this logic. Many colleges and universities – including a good number whose names are widely recognized – operate on older, unsustainable financial operating models that lack coherence and transparency. Looking at ways that combine a mix of people, programs, and facilities to create not only efficiencies and economies of scale but also new opportunities for students and faculty is something of a no-brainer. The problem is that the spark that triggers the kinds of changes that higher education institutions must make is missing. The protectors of the historic traditions that shape the governance of these institutions support, at best, incremental change and point correctly to the relative handful of closures and mergers annually to make their case for the status quo. The root of the problem is perhaps that no one is talking about overall health, focusing instead on trend lines and a murky future. Many argue that solving the growing income disparity in America, or waiting it out for more robust economic growth, will largely make the concerns over sustainability in higher education go away. History doesn’t support this analysis. There have been distinct phases of growth in higher education. One in particular in the 19th Century illustrates the kind of future that might be in store for American colleges and universities. In the 19th Century, the predominant trend that followed a period of expansion in American higher education was a surprising number of mergers and closures, especially as the Civil War deaths decreased that generation’s ability to support colleges and universities across the country. By the end of the century, a new commitment to public, professional, and graduate education reshaped the higher education landscape. The point is that change happens and that the record supports an unsteady and uneven evolution ahead. As we look at the Parthenon-EY Education study, it is essential to think through how best to prepare for change. The worst case is that either side – whether incrementalists or disruptors – wins. It is far better to imagine a negotiated evolution. To do so, we must do a much better job of linking data with a more thoughtful education of key higher education constituencies to produce a common understanding of the issues. It must begin with the recognition that American colleges and universities are – overwhelmingly – tuition dependent, endowment poor, and debt ridden. Many are open enrollment institutions with archaic management practices. And most important, governance practices and constituency perceptions must be brought into better alignment with what the data suggest. There’s a tremendous opportunity to manage the crisis to a more sustainable future. But it must start with a recognition that the fundamental disconnect between what the data tell us and what uninformed campus communities think is happening must be reconciled quickly. In September 2012, I chose to begin to contribute to the national conversation about higher education by tackling the concept of leadership in one of my first blogs for the Huffington Post. In that article, I suggested, “the job has evolved, but the national imperative for presidents to lead as well as govern remains constant.” As leaders of institutions who incubate ideas, college and university presidents are ideally positioned to make a significant contribution. shared governance values process and consensus over outcomes making it more difficult for “change agent” presidents to succeed. While the reception the post received persuaded me to continue to publish and speak out on issues of higher ed leadership and governance, there was something missing from my argument. The recent dust-ups among college presidents, boards of trustees, and faculty reinforce the continuing crisis in shared governance. The cold fact is that there is no evidence to suggest that presidents seeking to lead have any incentive to do more than preside. It’s dangerous to put your tenure on the line and imperative that you know when to fall on your sword. What I missed in that first blog, however, was that there is a practical side to college leadership. The biggest failure in shared governance is the lack of broad-based education about the issues facing those who govern America’s colleges and universities. Trustees are the most poorly educated. There is a corresponding need to keep faculty fully informed, especially on issues that affect higher education beyond the college gates. All parties should be watching the platform positions taken by the two presidential candidates, for example, to determine how the potential implementation of these positions will affect their institution. But there is a practical dimension to leadership. What you know, how much you know, and where and how you educate yourself has a direct relationship to the quality of shared governance on a college campus. Education begins with the presidents, given their role as chief spokespersons and chief executive officers. A president must be an informed generalist on almost any subject that affects higher education. It’s hard to be transparent in a university community when you don’t know much about the subjects that most affect it. 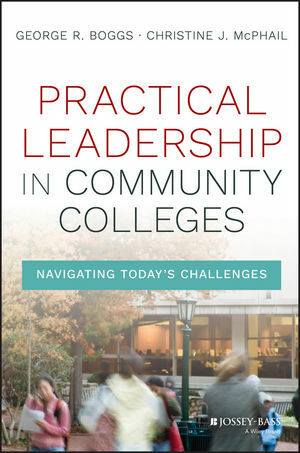 A new book by George Boggs and Christine Johnson McPhail, Practical Leadership in Community Colleges: Navigating Today’s Challenges, is a must-read for senior leadership at every level – including faculty, senior staff, trustees, and presidents. The authors, both seasoned higher education leaders, use field experiences, reports, news coverage, and interviews with leaders and policy makers to review some of the challenges facing college leadership and offer advice on how best to navigate and succeed against the crosscurrents that leadership faces. They offer case studies to show in practical terms how the job gets done. Drs. Boggs and McPhail have performed an invaluable service because they offer a readable primer that is also a continuing resource, especially for new leadership. Its value extends across American higher education, although the concentration is on America’s community colleges. Their book is where the theoretical meets the practical. In a recent interview with George Boggs, I asked why practicality would resonate with leaders whose day job is to be “big picture” oriented. Boggs replied that higher education leadership emerges unprepared from a variety of backgrounds. He argued persuasively that the range of topics, venues, and constituencies presumed a deeper understanding among new presidents than exists today. You come away from a book like Practical Leadership asking about the policy behind the advice. Boggs suggested that he and Dr. McPhail view helping students succeed as the greatest challenge facing American higher education. They remain encouraged that major foundations and national policy makers are tackling pieces of the foundation upon which student success is built. Perhaps that’s what’s best about this new primer. It’s optimistic and hopeful – a kind of “roll up your sleeves and get the job done” approach to leadership. In that blog four years ago, I suggested that presidents must have the courage to lead. Boggs and McPhail now demonstrate that it is also important to know how and why. Late last month, the board of trustees fired Suffolk University’s president, Margaret McKenna, for cause. She is the fifth president in five years to depart the school. The six-month saga had more thrills, spills, and missteps than the Republican National Convention in Cleveland and has become something of a spectator sport in Boston. Ms. McKenna, a civil rights lawyer, foundation head, and former university president, is much respected and widely known throughout American higher education. The Board hired an independent investigator and found breaches in her employment agreement and fiduciary responsibility that justified the termination, according to an email from the board. Ms. McKenna released her own statement saying that she was given three reasons for her termination. The Board complained that she had inadequately communicated with the board about university accreditation officials, improperly provided information to the accreditors, and participated in a meeting with the Boston Globe’s editorial board when the first effort to oust her occurred in February. The Board released its email to a largely empty campus and terminated Ms. McKenna well before the start of the new academic year. It appointed the provost as the interim president and named a trustee to head the search committee for a new president. Let’s be clear about the principal issue facing Suffolk University. It’s no longer about shutting down the friendly fire nor is it about contributing further to the ceaseless gossip in the growing “she said/they said” debacle. Indeed, both sides need to get past what happened quickly and reach an accommodation immediately. If all parties love Suffolk University – as they profess they do – then the University community must move forward to understand the root cause of the mess they have created. The point is that it is pointless to litigate Suffolk’s crisis in the court of public opinion. What is essential, however, is that the shared system of governance at Suffolk – or what is left of it – must begin to function again. The actions by the University’s board of trustees indicate at the moment that the board does not understand that it is the problem. The board’s actions have been vindictive, exceedingly public, secretive, lacking transparency, and hopelessly insular. Its recent actions are like watching the captain on the Titanic rearrange the deck chairs moments before the ship collides with the iceberg. Anyone could see it coming. Let’s state the obvious – the board has completely lost its credibility. It is divided, badly factionalized, and hopelessly out of touch with how American higher education works. The terms of the February agreement keeping Ms. McKenna in place for almost 18 months effectively set up her to fail by not crafting a corresponding climate to ensure her authority, and therefore, her success. To fix Suffolk University, the board must begin by acknowledging its own mistakes. It cannot correct from within by appointing trustees, no matter how well regarded, to begin a new executive search. To regain credibility, the Suffolk Board must also reach out in full transparency to faculty and remaining senior staff – the three legs of shared governance in higher education – to describe a transparent and believable search process around which the Suffolk University community can rally. It must also conduct a nationwide search that does not presume that local candidates best suit the needs of a national university. These conversations must go well beyond the boardrooms and legal offices populating Boston’s skyscrapers where much of the mischief began. For the moment, Suffolk’s trustees will need to borrow against the credibility of respected national voices to have any hope of attracting a deep pool of qualified candidates. Perhaps the greatest mistake that Suffolk’s trustees can make in the coming months is to fail to understand that American higher education is watching. They will face difficult, painful angry conversations with faculty, students, alumni, donors, and other key stakeholders. It is likely a given that donor support – especially among alumni and parents — will take a hit. But what should worry trustees the most is Suffolk’s loss in national standing due to the damage that they have inflicted on its reputation. American colleges and universities take decades to burnish their academic standing among their peers. It usually takes as long for the standing to decline as inattention, board overreach, or weak administrations – or some combination of all three – extinguish the reputational flame. But Suffolk’s trustees have managed to diminish the standing of the institution that they are obligated to protect with a parochial swiftness that is almost breathtaking in its arrogance and insularity. In these kinds of crises, you can fix almost anything. Sometimes you can hide in plain sight, wait it out, and confuse the issue. But what you cannot do is fix a broken reputation. Suffolk University is a good place. It deserves better. American higher education’s operational model is based on outmoded — and some (myself included) would argue, unsustainable — revenue and expense assumptions. In a “Futurist” piece in NACUBO’s Business Officer magazine (July/August 2016), I argue that institutions must look inward to develop a budget format that creates a sustainable financial model appropriate to changing circumstances on college and university campuses. To achieve financial viability, each institution will have to manage change by developing new financial models after evaluation its own set of strengths and weaknesses. Many institutions will succeed; some will not. …The biggest variable is the experience and innovative capacity of the leadership. Specifically, it will be critical to match changing financial practices with modernized, streamlined and better informed governance — beginning with how trustees see their role in shared governance. Click HERE or on the image below to read and/or download the article. Click HERE to read the article and the entire issue on the Business Officer site.